January 29, 2018 January 28, 2018 / Elizabeth T.
Though I love coffee so much, drinking so much coffee actually takes a toll on… my teeth! I know it’s not something that’s always at the forefront of our minds, coffee and tea are beverages that can easily stain your teeth. Over the course of the last few years, I’ve tried my fair share of drugstore whitening products, such as whitening toothpaste and whitening strips, since I knew that a beautiful smile with sparkling white teeth is one of the best fashion accessories anyone can have! This is why I’m so excited today to be sharing with you all my recent teeth whitening process with Smile Brilliant that’s tried and true! 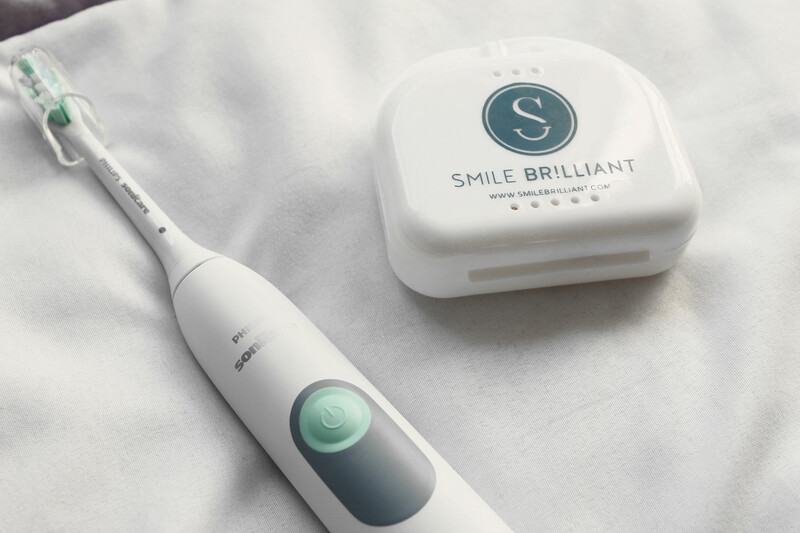 Smile Brilliant Professional Teeth Whitening offers an at-home, professional strength, custom teeth whitening kit that’s recommended by more dentists than any other procedure in America. 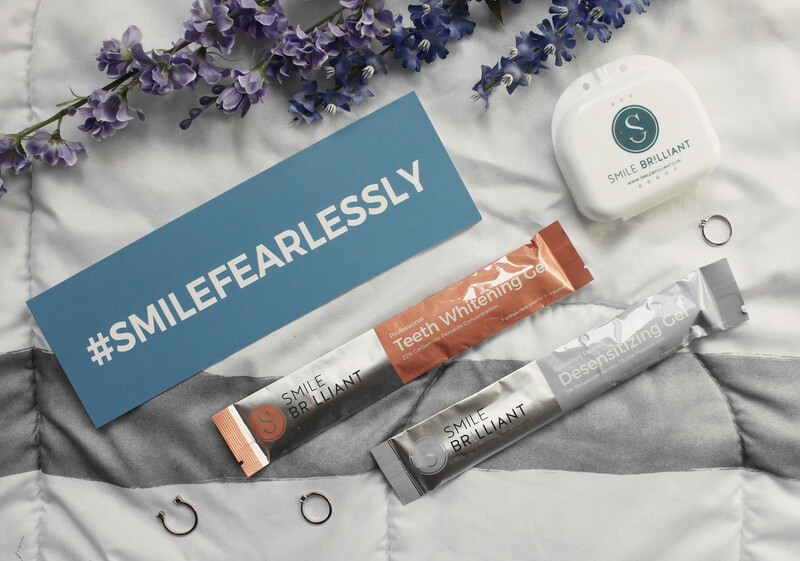 Smile Brilliant sends you everything you need, including putty mold, the instructions to make your dental impressions, whitening gel, as well as desensitizing gel. All you have to do is make your mold at home, send it back in the pre-paid padded envelop, and wait for your trays to come back before you start whitening! How Long Was the Whitening Process? I whitened every other day for about three weeks, and I left the trays on every time for about 45 minutes. Did I Experience Any Sensitivity? As with any teeth whitening procedure, teeth and gums will experience some degree of sensitivity, depending from person to person. This is where the desensitizing gel comes in to play! In between whitening sessions, you can just fill your trays with it and pop them in for about 15 minutes, and it really helps to relieve any tooth sensitivity, since it replenishes natural minerals in the teeth and prevents new surface stains from forming! Yes! To be honest, I saw results after the first session already! It was really amazing how fast it worked! I’m definitely very satisfied with the results! And here’s your chance to experience this amazing teeth whitening experience too! Or you can get your own personal teeth whitening experience for 5% OFF with promo code clothestoyouuu! I used smile brilliant in July and my teeth are SO white still! It’s insane and I always get compliments on them! I have used them and the results were great! Yesss, it’s amazing! 😀 I’ve stopped for a few weeks now, but my teeth are still so white! Haha me too! ❤ 🙂 You can still win a teeth whitening experience too! Just click on the little giveaway link! Okay I seriously need to try this! Awsome! Will love to check this product out. Thanks babe! ❤ 🙂 And yes, you definitely should! There's a giveaway too, if you want to enter!